I hope the YumYum Divas don't start chasing me with those beaters after posting some recipes, but I thought it would be good to share some summer recipes. These are recipes that are quick, easy, and don't require the oven, or even much stove time, so they don't heat up the kitchen or house that much, either. And, they are invented by me, so you can share them as you want to, although I would appreciate being recognized as the inventor. 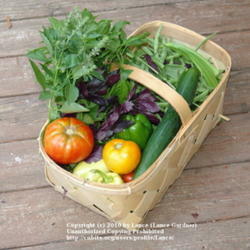 Garden recipes from Lance Gardner. These are my own recipes, not from a book. This is one of my favorite all-in-one-meal recipes, which uses different fresh ingredients. First, grind your fresh grains and make a nice whole grain hearty flavored bread. 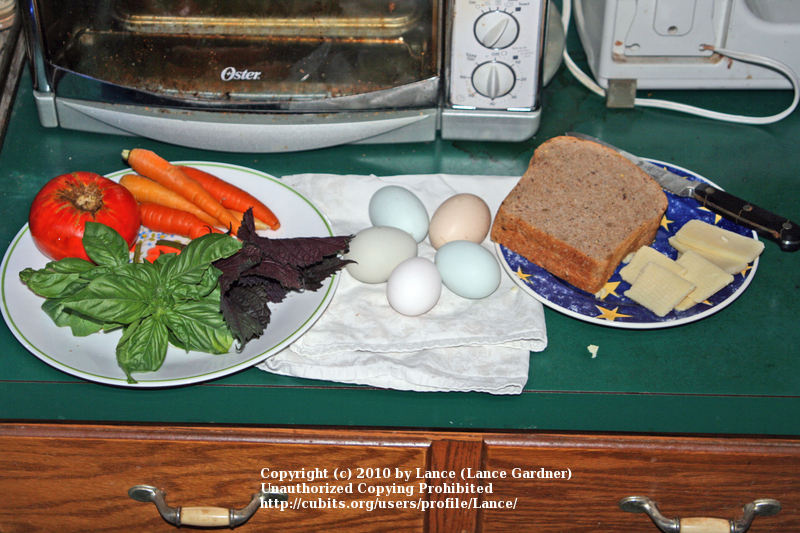 Then, go pick the basil and tomato from the garden, and gather some eggs from your henhouse. 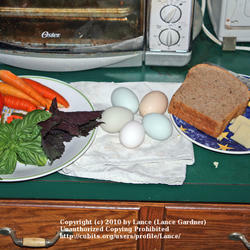 (If you try to gather the tomatoes from the henhouse and eggs from the garden, it might not work.) What is that you are saying? You don’t have your own garden fresh tomatoes? Trading for some of these items works, as well, but fresh is always better. I know we all have our own chickens for fresh colorful eggs! 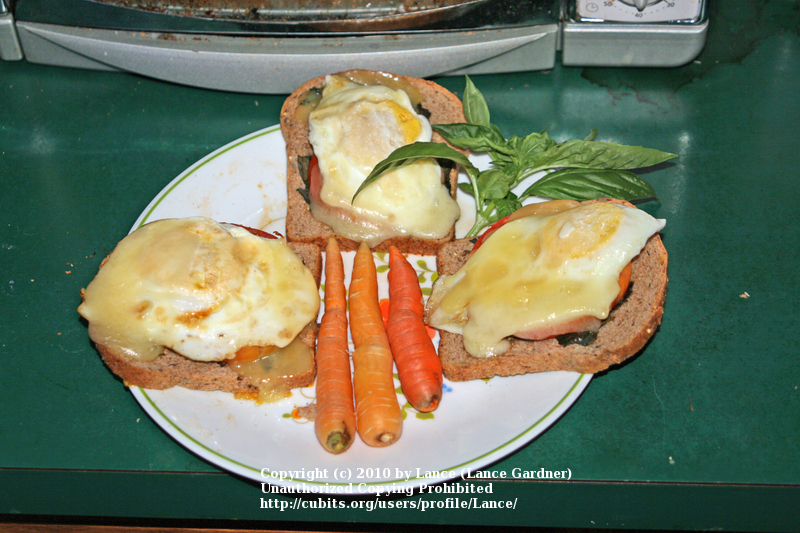 This is an open-faced sandwich, so keep this in mind while you prepare the ingredients. Lightly toast the bread. 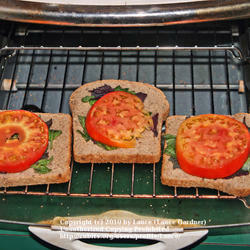 While the bread is toasting, slice the tomato into about ¼ - ½ inch thick sandwich size pieces. You can slice the cheese now, as well, if it is not already done. Set the tomato, cheese and basil aside. Cook the eggs, depending on how many you want on your sandwich - one fried egg fits nicely on one slice of bread. 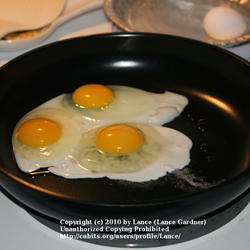 I prefer fried, but you can also make them omelet style, so long as you can take out the eggs out in one piece. 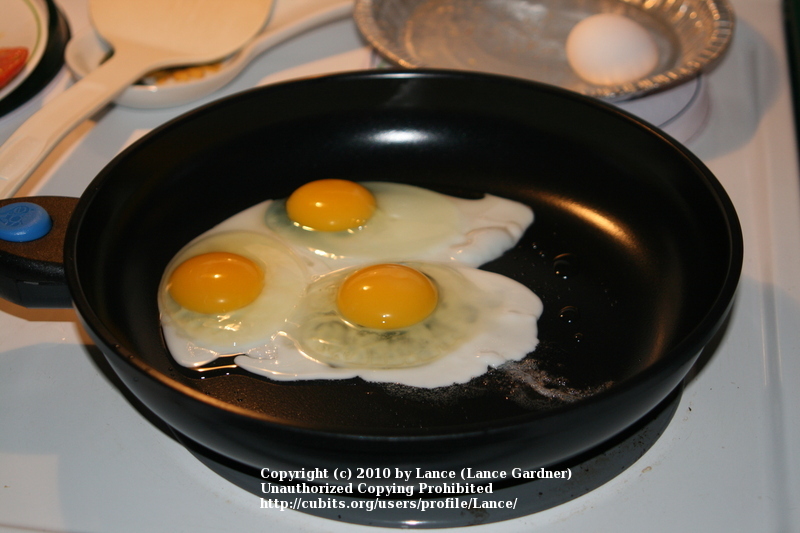 The cooked eggs will need to fit on the toasted bread, so size your pan and number of eggs accordingly. starts to melt. Remember, the bread is already slightly toasted, so do not cook too long or you may burn the bread. 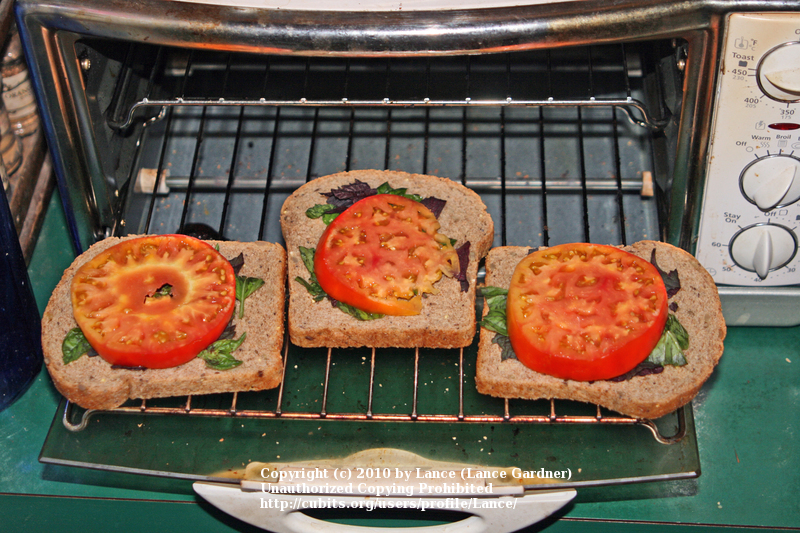 Variations: Vary the ingredients as you want to change the flavor, such as different types and flavors of bread, different types of basil, and different flavored tomatoes. In the photo, there are some dark red Perilla frutescens leaves, as well. Remember that whatever you use should be easily eaten, so a fuzzy large whole Perilla leaf may not work as well, but chopped up may be OK. This is one of my favorite fresh summer recipes, and it is really easy to make. Cut up the squash into thin rounds or small pieces, and cut the tomatoes into similar small pieces. I prefer about equal amounts of squash and tomatoes, but that is not necessary. Place them into a medium sized microwave bowl. (Note: I prefer basic Corelle dishes in the microwave, as they are more difficult to break, and are made of laminated glass, so there is no leaching of plastic residue.) Strip the leaves off of the basil stem, rip the leaves up into small pieces and put into the bowl with the tomatoes and squash. Cook this in the microwave for 5 minutes, stir, and finish cooking until soft. Garnish with more fresh basil if desired. Variations: If the tomatoes are really producing well, I will cook a large bowl of tomatoes with whatever produce and herbs are picked that day, save some for dinner on pasta, rice or similar, and freeze the rest. This recipe is below. This is another easy one, and with some unique flavor enhancers. Put the basil, tomatillos, tomatoes, garlic and olive oil into a food processor, and blend until smooth. More olive oil can be added if it does not seem to be chopping consistently. You can remove the tomato seeds if you want to, but I never do. Add the nuts and chop a little more, just until the nuts are small pieces but not entirely obliterated. The nut chunks add to the texture. There is no need to cook this. Use as a sauce over pasta, rice, couscous, or something similar. This can also be used as a flavoring for many fresh vegetable dishes. 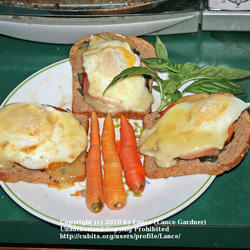 Variations: I use many different flavors of basil, as well as other herbs, to vary the flavor of the pestos that I make. 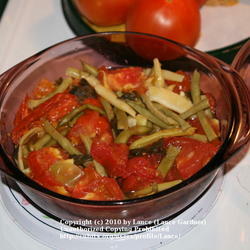 I will also use different amounts and types of tomatoes and tomatillos to adjust the consistency and flavor. A wonderful way to use up all of those tomatoes for dinner tonight and freeze the rest for later. 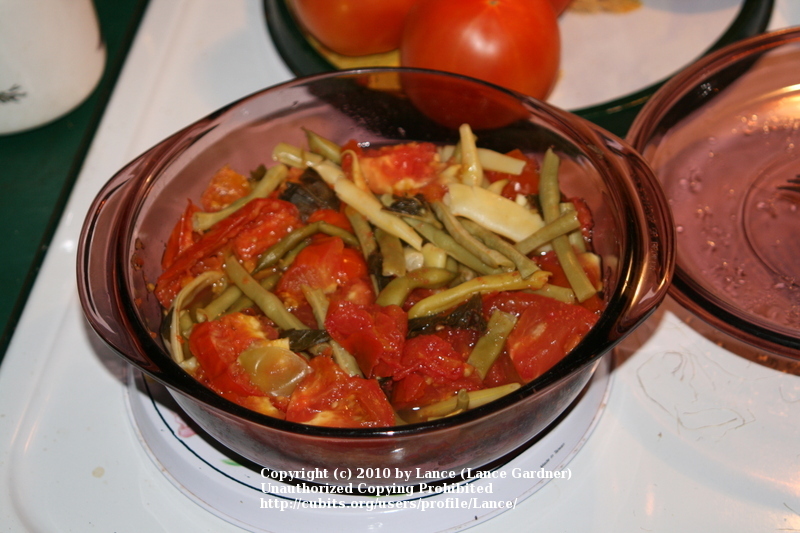 Cut up enough tomatoes, beans, peppers, onions and squash to fill the bowl about ½ full. Finely chop or mince the herbs and garlic, and put in the bowl with the tomatoes. Mix the herbs in well. Finish filling the bowl with more produce, and mix a little more if you can. Cook in the microwave, stirring every 10 minutes, until the tomatoes are really soft and mix in well. As the mixture cooks, the vegetables will cook down a little bit and fill in the air spaces, allowing a little more room for stirring. After it is all cooked, mix in the olive oil. Save some for dinner, and freeze the rest in one meal portions. This can be used over many different things, including pasta, rice, other cooked grains, cous-cous, bulgur, and even potatoes. Some tricks I have learned to make the preparation go a little faster: Cherry tomatoes do not need to be cut up, just poke a hole in them so they do not explode. I do not skin the tomatoes because I do not care about the skins, so long as the tomato pieces are small enough. Small tomatoes do not need the cores removed, but for larger ones, cut off about one inch from the stem end so it will lay flat on the cutting board, and then do 4 quick straight cuts around the core to remove it. The pieces cut off are a perfect size for cooking. If the herbs are small leaved, such as oregano and thyme, I usually mince them first with the garlic in a food processor with some extra virgin olive oil or some of the tomatoes, although I am also pretty good with a cleaver for mincing them. If the beans are picked young enough and are a stringless variety, you should not have to ‘snap’ them. Line up the ends of a handful on the cutting board and use a long knife or cleaver to cut off the stem ends all at once, repeat with the pointed ends of you want to (I rarely do), and then cut into smaller pieces. Much faster than going one at a time. Variations: The variations on this are almost endless, especially if you start with just the tomatoes and basil. 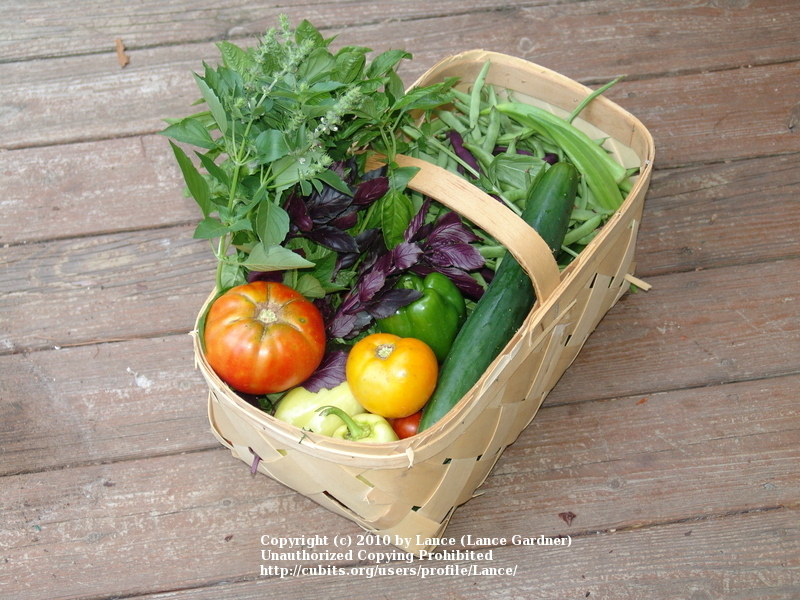 I think just about any fresh garden produce goes well with tomatoes and fresh herbs, including peas, fresh shelled beans such as limas or cranberry beans, chard, onions, carrots, potatoes, and many others. Tomatillos can add a very nice slightly sweet tart flavor. Vary the fresh herbs used, such as oregano, thyme, and rosemary, as well as different basil types, for different flavors.